SPEC MIX Self Consolidating Grout (SCG) is designed to completely fill cores in masonry units at a higher rate of flow than standard masonry grout. 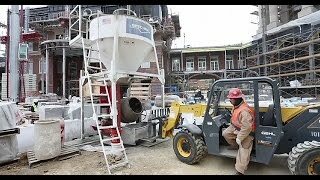 All the constituents of SPEC MIX SCG are dispersed and suspended evenly throughout the masonry core to eliminate mechanical consolidation or reconsolidation during or after placement at any lift height. Anytime structural reinforcement (core fill grout) is necessary, SPEC MIX SCG can be used to create a high quality structurally reinforced masonry assemblage. SPEC MIX® Self Consolidating Grout (SCG) is a dry preblended grout specifically designed to be highly fluid without segregation of the constituents. SPEC MIX SCG is produced in Fine or Coarse mixtures and used to bond together adjacent masonry units, fill bond beams and occupy all areas around steel reinforcement in the cores of the masonry assemblage without mechanical consolidation or reconsolidation. SPEC MIX SCG offers significant labor saving opportunities to the masonry contractor while providing enhanced performance over standard grout products and conventional grouting techniques. SPEC MIX SCG provides superior fluidity over conventional core fill grout with increased cohesion while offering excellent resistance to segregation of the fluid grout mix. Masonry cores can be easily and completely filled with no consolidation effort (mechanical vibration), and SPEC MIX SCG produces masonry cores without voids, even around heavily congested reinforcing steel and other obstructions. Using SPEC MIX SCG will ensure high structural integrity of both reinforced and un-reinforced masonry assemblages. Only the addition of water is needed to produce a self consolidating grout with total quality control and consistency in every batch that is ready to use when it is needed. Like ordinary grout, SPEC MIX SCG should be installed in accordance with the provisions of the local building code, ICC, MSJC, and The American Concrete Institute’s requirements and specifications TMS 402/602 Building Code Requirements for Masonry Structures and Specification for Masonry Structures. SPEC MIX SCG may be used in both low-lift and high-lift applications. Special consideration should be used in selecting the type of grout used for a particular application. SPEC MIX SCG may be placed by hand or by mechanical delivery. Each SPEC MIX manufacturer certifies that SPEC MIX SCG products are designed to meet ASTM property requirements for core fill grout. A digital print out displaying proper proportions of each batch may be kept as a permanent record before the SCG is completely preblended and packaged in the appropriate size bag. SPEC MIX SCG is accepted for all types of masonry construction with submittals available upon request.